Two of the broad, flat farm fields that we passed on the way to my daughter’s school this morning. There must have been a thousand robins in the low grasses. No kidding, a thousand. I am not a huge fan of robins but this was almost other-worldly. A strange sight, but peaceful and rhythmic in its way. I think they were all pulling up worms. Certainly the brightest spot these last few days was talking to my great friend Stacey, a friend I have known since at least 6th Grade. 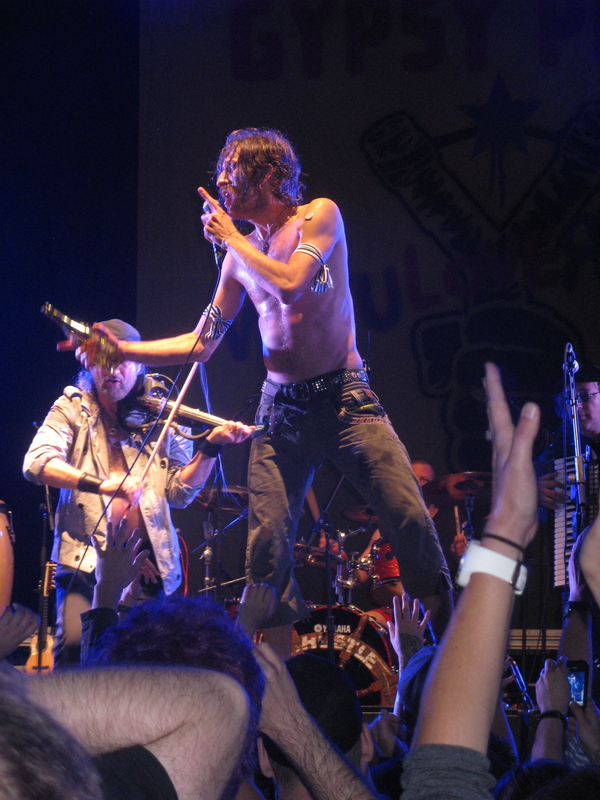 The only reason I came upon Gogol Bordello was because of several references that Stacey made to them on Facebook over the last year or so. This led to my further investigation and desire to see them live. And she let out a rip-roaring laugh. She lives in Miami, F-L-A, and you know, it didn’t even occur to me until she laughed what 50 degrees could mean to someone from warmer climes. Of course, that is only the tiniest glimpse into our hour-long phone conversation. Every time I have spoken with her over the last two years, I get in some deep laughs. It is this kind of connection with women in my life that carries me as I age, as we age, as our parents whither and sometimes die, as our skin gets closer and closer to the ground, and as we weather the unpredictable, and literal, ebbs and flows of uterine blood. My contact with Stacey was the “sweet refreshing show’r” of my week and I have been drinking it in every day since. Yassou, Stacey! A Better Day Than Yesterday (I quite like this one and am keeping it under consideration, or some variation thereon). Also, I cobbled together something like “Take that thing out of your ear” from Pam’s comment. As sweet as it sounds, I don’t think it would adequately point in the direction of things for which I am grateful. For now, I am sticking with “Thankful Thursday” as the moniker.